My father, Mark Moran, first learned about wheel repair in the early 1980's while working as a frame straightening specialist at an automobile repair shop in Houston, TX. They had been doing wheel repair since the 1950's but almost completely on steel car wheels. When aluminum and magnesium alloy wheels started becoming more popular it became evident that they needed to upgrade the wheel straightening machines to be able to straighten these wheels as well. After much research and development it was done, and wheel repair became a huge success in Houston, TX. My father decided at that time to bring this technology to the New England area when he returned in 1990. After finding an investor, he spent over a year redesigning and building our first alloy wheel straightening machine, and in 1992 we opened Rim and Wheel Works in Newton MA. In 1995 (due to many requests) we started doing research and development for straightening alloy motorcycle wheels, and in 1996 my father built our first alloy motorcycle wheel machine. Shortly after that Mark decided to move back to his home in New Hampshire, and built a shop where M.C. Wheel operated in until 2003. In 2002 Mark was diagnosed with throat cancer. As his health declined he was less able to run the business and in 2003 I began running the shop. Mark's cancer required surgery which I am pleased to say was a success. He now enjoys life in the happy pioneer valley in Massachusetts. In the nearly 20 years we have been operating, we have repaired thousands of wheels, and not one failure due to our straightening process (this does not include wheels that are beyond repair), and, as always, we don't charge for unrepairable wheels. We are located at 37 W. Plata st, just off Stone ave by the Wildcat House. 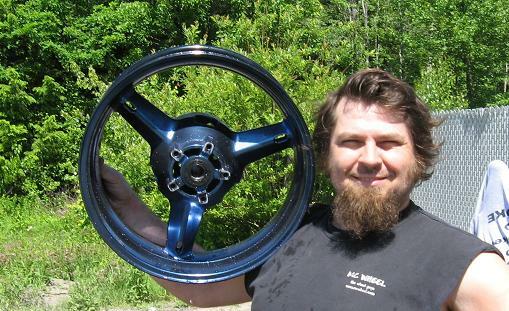 Noah holding a rear wheel we straightened, welded and powder coated for a stunt bike.